Most investors are likely aware that geopolitical turmoil exerts its toll on the markets and, in turn, on their investment portfolio. A massive crisis is not even necessary to impact someone’s portfolio value. Market volatility is something every stock and bond investor has to learn to endure. A capital gain is the difference between an asset’s adjusted basis and its current value. If an asset’s value appreciates, it will have an “unrealized” gain. Unrealized means the profit exists on paper that has yet to be sold for cash. A gain only becomes realized once the asset is closed for profit. 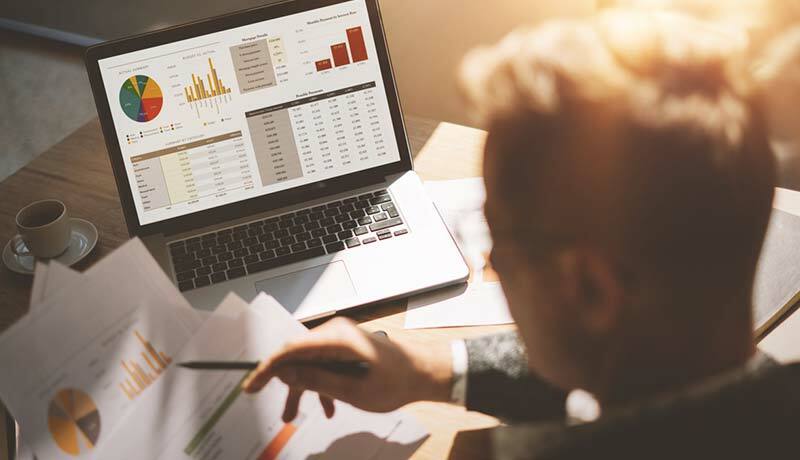 If an investor decides they want to sell a portion of their investment portfolio to avoid the market’s gyrations, they must take serious consideration in the risk coming with that sale and the tax on their capital gains. For example, assume the investor’s adjusted basis is $1 million, this would mean the value of their portfolio sold appreciated to $2 million during their hold time and when they sell that portion, their profit will be $1 million. This is the current $2 million value, less the $1 million basis. However, the investor does not walk away with that $1 million. Rather, the profit will be taxed at a rate of 23.8%1, assuming their state doesn’t level a capital gains tax. The potential result is that they would owe the Internal Revenue Service (IRS) $238,000. While the remaining $1.762 million is still a tidy sum, it would be more beneficial for the investor to hold the tax money, rather than immediately handing it over to the government. Donate your investment to a charity and avoid paying taxes. “Harvest” losses in your investment portfolio to offset the gains. Leave it to your heirs. They receive a step-up in basis to fair-market value, meaning no taxes are owed on any gain2. Invest your gains into a Qualified Opportunity Fund. This exciting option became available on Jan. 1, 2018. While giving you some powerful tax advantages on your capital gain liability, it also allows you to do good in the community. As previously discussed, the Qualified Opportunity Zones Program, in which investors can place capital gains from an asset sale into federally designated Qualified Opportunity Zones (QOZs) through investment in certified Qualified Opportunity Funds (QOFs). These investment help build up a lower-income area, while deferring capital gain taxes until Dec. 31, 2026. A five-year hold gives you a 10% step-up in basis on your original deferred gain. A seven-year hold gives you an additional 5% step-up in basis on your original deferred gain. An investment held for 10 years or more means you owe NO capital gains taxes on any appreciation that occurs within the fund once it is liquidated. Other Assumptions: Taxpayer is married filing jointly with ordinary income of $500,000 (35% federal tax bracket). Each opposing investment is assumed to have the same return on investment (7.5%), and same annual appreciation (5.0%). Liquidation values are assumed to be added to pre-tax cash flow in 2028. After-tax earnings exclude negative cash-flow from initial investment in 2018. 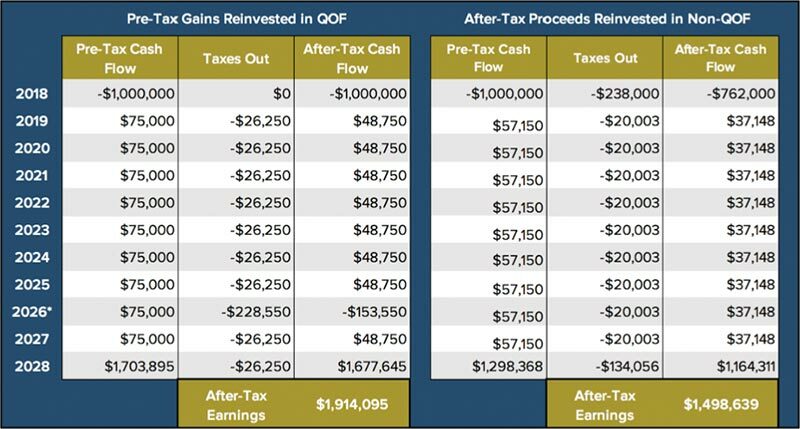 * Deferred capital gains tax realized on QOF investment - includes 15% step-up in basis. Includes ordinary income tax on $75,000 of investment income earned. All other assumptions being equal, the investor could earn incremental after-tax earnings of $415,456 -- in other words, a 27.7% increase in total cash earned over a 10-year period, simply by deciding to invest their capital gains into a Qualified Opportunity Fund, versus a non-QOF investment vehicle. For the purposes of this example, the taxpayer is married filing jointly with income in excess of $488,500, and is assumed to have held the investment for more than one year. This rate assumes no other deductions have been taken, and only considers the long-term federal capital gains rate (20%) and medicare surtax (3.8%). Assuming your total estate is under estate tax exemption limits. This is a simplified hypothetical example. Actual tax savings may vary as they depend upon your tax rate, limits on deductions, impacts to your alternative minimum tax, and any other tax related items specific to an investor.